Azure Active Directory (Azure AD) uses OAuth 2.0 to enable you to authorize access to web applications and web APIs in your Azure AD tenant. This guide is language independent, and describes how to send and receive HTTP messages without using any of our open-source libraries. 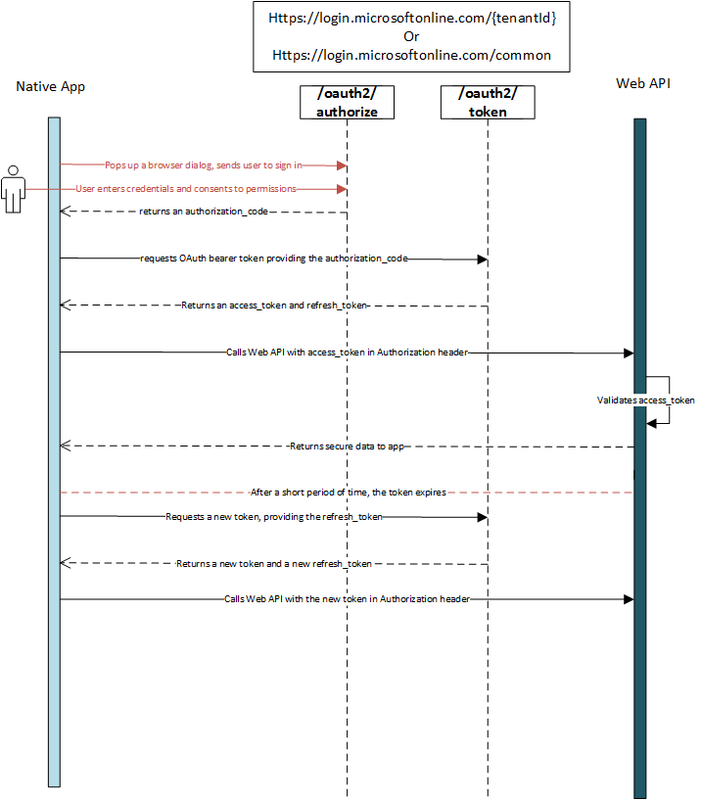 The OAuth 2.0 authorization code flow is described in section 4.1 of the OAuth 2.0 specification. It is used to perform authentication and authorization in most application types, including web apps and natively installed apps. First, you need to register your application with your Azure Active Directory (Azure AD) tenant. This will give you an Application ID for your application, as well as enable it to receive tokens. Choose your Azure AD tenant by clicking on your account in the top right corner of the page, followed by clicking on the Switch Directory navigation and then select the appropriate tenant. Skip this step, if you've only one Azure AD tenant under your account or if you've already selected the appropriate Azure AD tenant. In the left hand navigation pane, click on Azure Active Directory. Click on App Registrations and click on New application registration. Follow the prompts and create a new application. It doesn't matter if it is a web application or a native application for this tutorial, but if you'd like specific examples for web applications or native applications, check out our quickstarts. For Web Applications, provide the Sign-On URL, which is the base URL of your app, where users can sign in e.g http://localhost:12345. Once you've completed registration, Azure AD will assign your application a unique client identifier, the Application ID. You need this value in the next sections, so copy it from the application page. To find your application in the Azure portal, click App registrations, and then click View all applications. The authorization code flow begins with the client directing the user to the /authorize endpoint. In this request, the client indicates the permissions it needs to acquire from the user. You can get the OAuth 2.0 authorization endpoint for your tenant by selecting App registrations > Endpoints in the Azure portal. client_id required The Application ID assigned to your app when you registered it with Azure AD. You can find this in the Azure Portal. Click Azure Active Directory in the services sidebar, click App registrations, and choose the application. response_type required Must include code for the authorization code flow. redirect_uri recommended The redirect_uri of your app, where authentication responses can be sent and received by your app. It must exactly match one of the redirect_uris you registered in the portal, except it must be url encoded. For native & mobile apps, you should use the default value of urn:ietf:wg:oauth:2.0:oob. response_mode optional Specifies the method that should be used to send the resulting token back to your app. Can be query, fragment, or form_post. query provides the code as a query string parameter on your redirect URI. If you're requesting an ID token using the implicit flow, you cannot use query as specified in the OpenID spec. If you're requesting just the code, you can use query, fragment, or form_post. form_post executes a POST containing the code to your redirect URI. The default is query for a code flow. state recommended A value included in the request that is also returned in the token response. A randomly generated unique value is typically used for preventing cross-site request forgery attacks. The state is also used to encode information about the user's state in the app before the authentication request occurred, such as the page or view they were on. resource recommended The App ID URI of the target web API (secured resource). To find the App ID URI, in the Azure Portal, click Azure Active Directory, click Application registrations, open the application's Settings page, then click Properties. It may also be an external resource like https://graph.microsoft.com. This is required in one of either the authorization or token requests. To ensure fewer authentication prompts place it in the authorization request to ensure consent is received from the user. scope ignored For v1 Azure AD apps, scopes must be statically configured in the Azure Portal under the applications Settings, Required Permissions. prompt optional Indicate the type of user interaction that is required. login: The user should be prompted to reauthenticate. select_account: The user is prompted to select an account, interrupting single sign on. The user may select an existing signed-in account, enter their credentials for a remembered account, or choose to use a different account altogether. consent: User consent has been granted, but needs to be updated. The user should be prompted to consent. login_hint optional Can be used to pre-fill the username/email address field of the sign-in page for the user, if you know their username ahead of time. Often apps use this parameter during reauthentication, having already extracted the username from a previous sign-in using the preferred_username claim. domain_hint optional Provides a hint about the tenant or domain that the user should use to sign in. The value of the domain_hint is a registered domain for the tenant. If the tenant is federated to an on-premises directory, AAD redirects to the specified tenant federation server. code_challenge_method recommended The method used to encode the code_verifier for the code_challenge parameter. Can be one of plain or S256. If excluded, code_challenge is assumed to be plaintext if code_challenge is included. Azure AAD v1.0 supports both plain and S256. For more information, see the PKCE RFC. code_challenge recommended Used to secure authorization code grants via Proof Key for Code Exchange (PKCE) from a native or public client. Required if code_challenge_method is included. For more information, see the PKCE RFC. If the user is part of an organization, an administrator of the organization can consent or decline on the user's behalf, or permit the user to consent. The user is given the option to consent only when the administrator permits it. At this point, the user is asked to enter their credentials and consent to the permissions requested by the app in the Azure Portal. Once the user authenticates and grants consent, Azure AD sends a response to your app at the redirect_uri address in your request with the code. admin_consent The value is True if an administrator consented to a consent request prompt. code The authorization code that the application requested. The application can use the authorization code to request an access token for the target resource. session_state A unique value that identifies the current user session. This value is a GUID, but should be treated as an opaque value that is passed without examination. state If a state parameter is included in the request, the same value should appear in the response. It's a good practice for the application to verify that the state values in the request and response are identical before using the response. This helps to detect Cross-Site Request Forgery (CSRF) attacks against the client. Error responses may also be sent to the redirect_uri so that the application can handle them appropriately. error An error code value defined in Section 5.2 of the OAuth 2.0 Authorization Framework. The next table describes the error codes that Azure AD returns. error_description A more detailed description of the error. This message is not intended to be end-user friendly. state The state value is a randomly generated non-reused value that is sent in the request and returned in the response to prevent cross-site request forgery (CSRF) attacks. The following table describes the various error codes that can be returned in the error parameter of the error response. invalid_request Protocol error, such as a missing required parameter. Fix and resubmit the request. This is a development error, and is typically caught during initial testing. unauthorized_client The client application is not permitted to request an authorization code. This usually occurs when the client application is not registered in Azure AD or is not added to the user's Azure AD tenant. The application can prompt the user with instruction for installing the application and adding it to Azure AD. access_denied Resource owner denied consent The client application can notify the user that it cannot proceed unless the user consents. unsupported_response_type The authorization server does not support the response type in the request. Fix and resubmit the request. This is a development error, and is typically caught during initial testing. server_error The server encountered an unexpected error. Retry the request. These errors can result from temporary conditions. The client application might explain to the user that its response is delayed due to a temporary error. temporarily_unavailable The server is temporarily too busy to handle the request. Retry the request. The client application might explain to the user that its response is delayed due to a temporary condition. invalid_resource The target resource is invalid because it does not exist, Azure AD cannot find it, or it is not correctly configured. This indicates the resource, if it exists, has not been configured in the tenant. The application can prompt the user with instruction for installing the application and adding it to Azure AD. client_id required The Application Id assigned to your app when you registered it with Azure AD. You can find this in the Azure portal. The Application Id is displayed in the settings of the app registration. grant_type required Must be authorization_code for the authorization code flow. redirect_uri required A redirect_uriregistered on the client application. client_secret required for web apps, not allowed for public clients The application secret that you created in the Azure Portal for your app under Keys. It cannot be used in a native app (public client), because client_secrets cannot be reliably stored on devices. It is required for web apps and web APIs (all confidential clients), which have the ability to store the client_secret securely on the server side. The client_secret should be URL-encoded before being sent. resource recommended The App ID URI of the target web API (secured resource). To find the App ID URI, in the Azure Portal, click Azure Active Directory, click Application registrations, open the application's Settings page, then click Properties. It may also be an external resource like https://graph.microsoft.com. This is required in one of either the authorization or token requests. To ensure fewer authentication prompts place it in the authorization request to ensure consent is received from the user. If in both the authorization request and the token request, the resource` parameters must match. To find the App ID URI, in the Azure Portal, click Azure Active Directory, click Application registrations, open the application's Settings page, then click Properties. Azure AD returns an access token upon a successful response. To minimize network calls from the client application and their associated latency, the client application should cache access tokens for the token lifetime that is specified in the OAuth 2.0 response. To determine the token lifetime, use either the expires_in or expires_on parameter values. If a web API resource returns an invalid_token error code, this might indicate that the resource has determined that the token is expired. If the client and resource clock times are different (known as a "time skew"), the resource might consider the token to be expired before the token is cleared from the client cache. If this occurs, clear the token from the cache, even if it is still within its calculated lifetime. access_token The requested access token as a signed JSON Web Token (JWT). The app can use this token to authenticate to the secured resource, such as a web API. expires_in How long the access token is valid (in seconds). expires_on The time when the access token expires. The date is represented as the number of seconds from 1970-01-01T0:0:0Z UTC until the expiration time. This value is used to determine the lifetime of cached tokens. resource The App ID URI of the web API (secured resource). scope Impersonation permissions granted to the client application. The default permission is user_impersonation. The owner of the secured resource can register additional values in Azure AD. refresh_token An OAuth 2.0 refresh token. The app can use this token to acquire additional access tokens after the current access token expires. Refresh tokens are long-lived, and can be used to retain access to resources for extended periods of time. id_token An unsigned JSON Web Token (JWT) representing an ID token. The app can base64Url decode the segments of this token to request information about the user who signed in. The app can cache the values and display them, but it should not rely on them for any authorization or security boundaries. For more information about JSON web tokens, see the JWT IETF draft specification. To learn more about id_tokens, see the v1.0 OpenID Connect flow. The token issuance endpoint errors are HTTP error codes, because the client calls the token issuance endpoint directly. In addition to the HTTP status code, the Azure AD token issuance endpoint also returns a JSON document with objects that describe the error. error An error code string that can be used to classify types of errors that occur, and can be used to react to errors. error_description A specific error message that can help a developer identify the root cause of an authentication error. error_codes A list of STS-specific error codes that can help in diagnostics. timestamp The time at which the error occurred. trace_id A unique identifier for the request that can help in diagnostics. correlation_id A unique identifier for the request that can help in diagnostics across components. The following table lists the HTTP status codes that the token issuance endpoint returns. In some cases, the error code is sufficient to describe the response, but if there are errors, you need to parse the accompanying JSON document and examine its error code. 400 Default HTTP code. Used in most cases and is typically due to a malformed request. Fix and resubmit the request. 401 Authentication failed. For example, the request is missing the client_secret parameter. 403 Authorization failed. For example, the user does not have permission to access the resource. 500 An internal error has occurred at the service. Retry the request. unauthorized_client The authenticated client is not authorized to use this authorization grant type. This usually occurs when the client application is not registered in Azure AD or is not added to the user's Azure AD tenant. The application can prompt the user with instruction for installing the application and adding it to Azure AD. invalid_client Client authentication failed. The client credentials are not valid. To fix, the application administrator updates the credentials. unsupported_grant_type The authorization server does not support the authorization grant type. Change the grant type in the request. This type of error should occur only during development and be detected during initial testing. interaction_required The request requires user interaction. For example, an additional authentication step is required. Instead of a non-interactive request, retry with an interactive authorization request for the same resource. Now that you've successfully acquired an access_token, you can use the token in requests to Web APIs, by including it in the Authorization header. The RFC 6750 specification explains how to use bearer tokens in HTTP requests to access protected resources. Secured resources that implement RFC 6750 issue HTTP status codes. If the request does not include authentication credentials or is missing the token, the response includes an WWW-Authenticate header. When a request fails, the resource server responds with the HTTP status code and an error code. authorization_uri The URI (physical endpoint) of the authorization server. This value is also used as a lookup key to get more information about the server from a discovery endpoint. The client must validate that the authorization server is trusted. When the resource is protected by Azure AD, it is sufficient to verify that the URL begins with https://login.microsoftonline.com or another hostname that Azure AD supports. A tenant-specific resource should always return a tenant-specific authorization URI. error An error code value defined in Section 5.2 of the OAuth 2.0 Authorization Framework. resource_id Returns the unique identifier of the resource. The client application can use this identifier as the value of the resource parameter when it requests a token for the resource. The recommended strategy for preventing an attack is to verify that the resource_id matches the base of the web API URL that being accessed. For example, if https://service.contoso.com/data is being accessed, the resource_id can be htttps://service.contoso.com/. The client application must reject a resource_id that does not begin with the base URL unless there is a reliable alternate way to verify the id. The RFC 6750 specification defines the following errors for resources that use the WWW-Authenticate header and Bearer scheme in the response. 400 invalid_request The request is not well-formed. For example, it might be missing a parameter or using the same parameter twice. Fix the error and retry the request. This type of error should occur only during development and be detected in initial testing. 401 invalid_token The access token is missing, invalid, or is revoked. The value of the error_description parameter provides additional detail. Request a new token from the authorization server. If the new token fails, an unexpected error has occurred. Send an error message to the user and retry after random delays. 403 insufficient_scope The access token does not contain the impersonation permissions required to access the resource. Send a new authorization request to the authorization endpoint. If the response contains the scope parameter, use the scope value in the request to the resource. 403 insufficient_access The subject of the token does not have the permissions that are required to access the resource. Prompt the user to use a different account or to request permissions to the specified resource. Access Tokens are short-lived and must be refreshed after they expire to continue accessing resources. You can refresh the access_token by submitting another POST request to the /token endpoint, but this time providing the refresh_token instead of the code. Refresh tokens are valid for all resources that your client has already been given consent to access - thus, a refresh token issued on a request for resource=https://graph.microsoft.com can be used to request a new access token for resource=https://contoso.com/api. Refresh tokens do not have specified lifetimes. Typically, the lifetimes of refresh tokens are relatively long. However, in some cases, refresh tokens expire, are revoked, or lack sufficient privileges for the desired action. Your application needs to expect and handle errors returned by the token issuance endpoint correctly. When you receive a response with a refresh token error, discard the current refresh token and request a new authorization code or access token. In particular, when using a refresh token in the Authorization Code Grant flow, if you receive a response with the interaction_required or invalid_grant error codes, discard the refresh token and request a new authorization code. token_type The token type. The only supported value is bearer. expires_in The remaining lifetime of the token in seconds. A typical value is 3600 (one hour). expires_on The date and time on which the token expires. The date is represented as the number of seconds from 1970-01-01T0:0:0Z UTC until the expiration time. resource Identifies the secured resource that the access token can be used to access. scope Impersonation permissions granted to the native client application. The default permission is user_impersonation. The owner of the target resource can register alternate values in Azure AD. access_token The new access token that was requested. refresh_token A new OAuth 2.0 refresh_token that can be used to request new access tokens when the one in this response expires. For a description of the error codes and the recommended client action, see Error codes for token endpoint errors.